and working with ESVR. We are absolutely interested in renting with ESVR again, and are looking forward to another trip to the Eastern Shore. Thanks so much for all your help! Tell the owner that we had an extraordinary time. The railings along the porch are dangerous (very loose) and someone could fall right through them in various places. The guest house would be better painted grey. A boat rental would have made it even more perfect. Thanks. GREAT FAMILY REUNION THANKS TO ESVR...PLENTY ROOM FOR ONE FAMILY WITH 4 CHILDREN AND ANOTHER FAMILY WITH 3. THEY LOVED EVERY PART OF IT AND THANKED ME ALL THE TIME...I LIKED THAT!!! We loved Sycamore acres; it was perfect for our group. The main house, guest house, and pool house all came in handy and were all great. We loved our stay and ESVR were very responsive to all questions and requests. The location was great: an easy bike ride to St Michaels, Easton, and the ferry to Oxford. Our dog loved it too! This is a beautiful,well maintained and comfortable property. There is something for everyone. Playing basketball, swimming, kayaking, walking and just enjoying this charming home and beautiful property. Thank you for sharing your vacation home! Sycamore Acres is the perfect vaction rental for a large family. My husband and myself together with our four grown children and their partners plus a baby had more than enough room. The main house is spacious and the guest house is such a bonus. This is our second stay at Sycamore Acres and we hope to return again next year. We have been arranging our vaction rental thru ESVR for years, the company is always very professional, friendly, helpful and responsive to any problem no matter how small. I wouldn't think of renting thru any other company. We enjoyed our christmstime vacation, went to the parade, the concert and just did a lot of cooking, eating and relaxing watching Christmas movies in the beauriful home. Only one thing could make it better, the main living area does not have a TV, there is a separate TV room but only 4 people can fit there comfortably. Since, we had 12 adults, we bring a TV & DVD player from home to put in the main room. It would be wonderful if there were a big screen TV above the fireplace, just a suggestion. Otherwise, perfect! Another year of a wonderful vacation. This is our second year here, I am getting ready to book our 3rd year. I have already recommended this rental to a good friend. This is a grandmothers dream. We stay in the cottage, all the kiddies and their parents stay in the main house. I get to sleep peacefully and go into the "big house" every morning to screams of "Nanny n Poppa 's here". Hugs, Kisses and a beautiful day!! House is well equipped, i did notice some changes from the new owners. Please thank them for allowing us to rent their house. ! !The property is so easy to live is safe, spaced out beautifully. Pool house is sooooo convenient, especially when dealing with little ones.What can I say..........I love it. On the first day, one of our 4 yr old. twin grandsons, Caden asked me if I thought that we could come back next year!!!! I told him YES!!! Beautiful property, lots of room, well-stocked kitchen. The heat initially didn't work in the second building, but the rental company arranged for a prompt repair. The well-stocked gym and sauna were an especially nice surprise. Our extended family has been up and down the East coast for beach vacations, this was the first time we didn't go to a beach. WE absolutely LOVED Sycamore Acres. It accommodated our large group perfectly. We enjoyed having a nice yard for some soccer and football. The owners have anticipated a vacationers every need as far as appliances and fun things to do. We hope to come back. HOME IS DECORATED WITH WONDERFUL TASTE. WE ARE AMAZED AT THE BEAUTIFUL LOCATION AND SCENERY . THE COTTAGE WAS VERY COMFORTABLE AND VERY BEAUTIFULLY DECORATED.!! !LOVED THE CONVENIENCE OF THE GREAT GYM. I THINK OUR ONE MAJOR COMPLAINT IS THAT THE ''QUEEN" BEDS WERE MORE LIKE FULL BEDS. VERY SMALL FOR "QUEEN". HOWEVER, WE MADE DUE AND WE REALLY ENJOYED OUR STAY. WILL HOPEFULLY STAY THERE AGAIN NEXT YEAR, IF IT IS AVAILABLE. The house was better than we expected. It's actually two houses and both are beautifully furnished. The main house seems to have everything you could possibly need from crab mallets to binoculars and games. The pool looked lovely but it was too cool for us to use it. The location was perfect for us to explore St. Michaels and Oxford. Sycamore Acres is the perfect family vacation destination! The property was spacious enough to accommodate a small family gathering to celebrate our parents 60th Wedding Anniversary, and also cozy enough for family bonding over breakfast, a game and pool, or tackling the 1000 piece puzzle set-up on the family room coffee table. We were very pleased with the quality of the pool, paddle boards and kayak, and made good use of all equioment. We also leverged the dock for our boat and made many, convenient trips to St. Michaels and along the beautiful Miles River. The property - inside and out, was well maintained and clean. Another Sycamore Acres vacation is definitely in our future! Great for a wintertime visit. Spacious enough for a few families with kids (including the guest house). The workout room and sauna were a plus for the adults. The open format of the main house was great to be able to socialize and cook and watch a bunch of kids without much worry. Highly recommend it. One comment is to have a book on how things work - disposal, sauna etc.. but that is easy to provide for the next guests. Thanks to Lisa at ESVR and her hard work to get us into Sycamore Acres after a bad storm we had a wonderful vac. The pool was wonderful in the 100 degree weather. All the inside accom. were 100%. Due to the storm the outside grounds could have had some clear up, timers reset etc. We would definitly consider this place again. Room for everyone. Another kayak would be great. The house is located right between St. Michaels and Easton; each town is within 10 minute drive, which was convenient. The house also features the main unit and guest unit, which is great is you have kids who would like to have their own space. Overall, the place is great. We are five artists who stayed at this beautiful property for five days. It was all we could hope for and we had more than enough room to gather and avoid each other as our needs dictated. It provided plenty of scenes for us to paint and even if the weather hadn't been perfect, we would have had lots to chose from inside. The kitchen is well equiped, the electronic equipment first class and the decor very inviting. The outside, wraparound deck was fabulous for just sitting with a drink and watching the wildlife and little boats go by. Very peaceful place and we will return. Great place to stay. Lots of room and great activities to keep everyone busy. Rented for 4 weeks, from 6/28 thru 7/26. Really enjoyed our stay! The house and amenities were all lovely. Its in a great location, there was plenty of room and there were things to do. The house was comfortably furnished. The property management company could not have been more co-operative and helpful. The only negative for the entire visit was that the internet and cell service was spotty. The Place Was Great!!!! The Personal at the rental office are very pleasant and helpful. The homes' decor is very pleasant and homey. Only problem was the realtor, walking in on our guest. Three had to be woken up so she could show the house. Would not have been a problem if had some notice. She just showed up, walked in and showed the house. Then she came back the next day did the same thing. No notice just shows up, says I'm showing the house. Told us she could do as she pleases, that we had no say. So who ever wants to rent this home make sure the Realtor knows the Laws and/or Contract. MUST GIVE 24 HOURS NOTICE to the tenants. Other than her arrogant and condescending ways the place was wonderful and would go back. Overall, it was a very nice place to stay and we really enjoyed our time. There was plenty of room for our group of 11 and the layout was conducive to family games and meals. Only a few issues - there were tons of spiders in the house and guest house! The grounds need to be sprayed professionally more frequently so that doesn't happen. Also, the home could use a little work. You can tell that some of the regular maintenance hasn't been happening. But with a little updating and pest control, it would've been perfect! This was our first vacation at Maryland's Eastern Shore and we absolutely loved it. 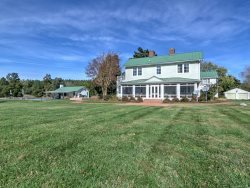 Swan's Rest is a lovely home that is beautifully furnished, has a very well stocked kitchen, and a screened-in porch which became our favorite family gathering spot. The grandchildren loved the pool, had great fun fishing off the dock, and looked forward to making s'mores at the burning pit each night. How lucky for us that the owners are willing to share this fabulous get-away. We also can't say enough good things about Eastern Shore Vacation Rentals. They helped to make our vacation a truly pleasurable and relaxing event.